And today, God said, "let there be an MMO." Browser-based MMOs cover a wide range of genres, but none have ever attempted to make religious texts interactive. That's all going to change, as German developer FiAA GmbH has announced The Bible Online, an upcoming browser-based MMO that will put players in the middle of events from the Old Testament. Even though this is an MMO/RTS, players don't take on the role of God. Instead, you get to play as Abraham - as well as his offspring Isaac and Jacob - as they set out for the promised land of Canaan. 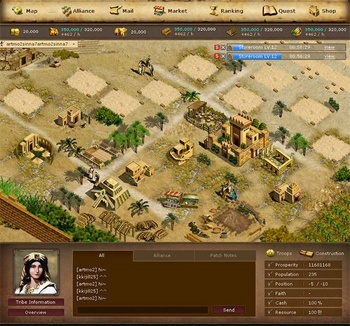 During gameplay, players build up villages, manage resources, and go to war (presumably to bring religion to the unbelievers). According to Dr. Alan Kim, president of GmbH, The Bible Online, "is developed for players of all ages to easily get closer to the Bible, while enjoying the game. We plan to service the game in most of the European languages by the end of the year. We will also develop following chapters to cover all the stories of the Bible." Players will apparently get to "reenact and witness" events from the Book of Genesis, though exactly how interactive moments like Caine's murder of Abel and the Great Flood will be (or if they'll even show up) remains to be seen. Meanwhile, how this game will make its money isn't entirely clear: presumably a monthly subscription fee or micro-transactions will be used, though neither seems terribly appropriate for a game based on bringing people closer to the Bible. I can't see the The Bible Online's development ending well. It's only a matter of time before someone condemns it as a mockery of religion or something, thus leading to a ton of controversy that this game likely doesn't reserve. Personally, I plan to boycott the game since it won't let me play as a vengeful god (thus denying me the opportunity to rain down destruction on Sodom and Gomorrah), but I suspect a lot of people are going to avoid it for other reasons.